It was the worst of trees, it was the best of trees. And now my former 90-year-old neighbour is no tree at all. It’s just a stump. Yes, it’s an invasive alien that someone a few generations ago thought would make a great street tree. It did. But Norway maples (Acer platanoides) have also edged out less competitive trees such as our native sugar maples (Acer saccharum) in wild spaces all over. It’s also hellish to try to garden under, with its wiry, thirsty, greedy roots and dense shade. There’s still one more of these giants in my other neighbour’s yard. You can see it on the left in the picture above. 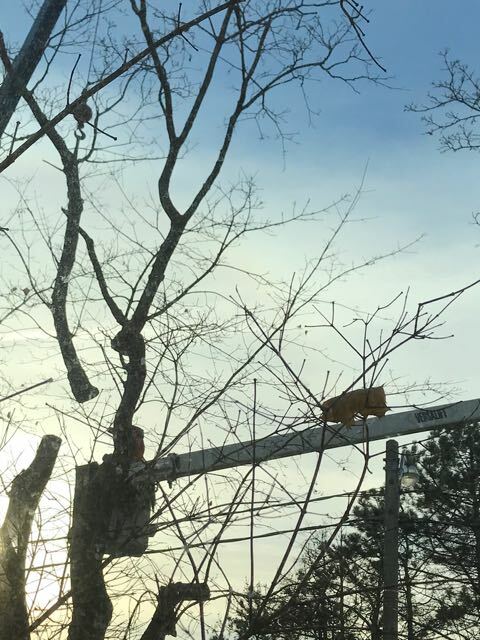 Edit: As reader Traci-Anna has asked why the tree was cut down, I thought I’d explain. 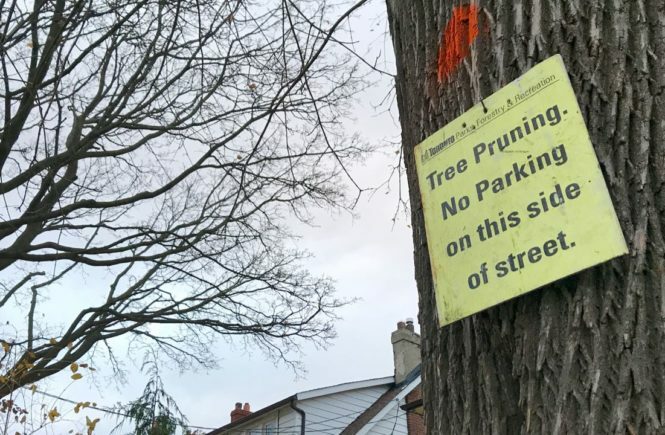 Unlike trees in a forest, urban street trees deal with many things that can weaken them, like pollution (which Norway maples actually tolerate, but sugar maples hate) or restricted root runs in small yards edged by concrete and asphalt paving. They also get pruned to avoid hydro lines, which can shape the crown in unwieldy ways, causing end-heavy branches to break. They’re also not sheltered by other trees, and so winter sun can damage the bark through freeze-thaw action. 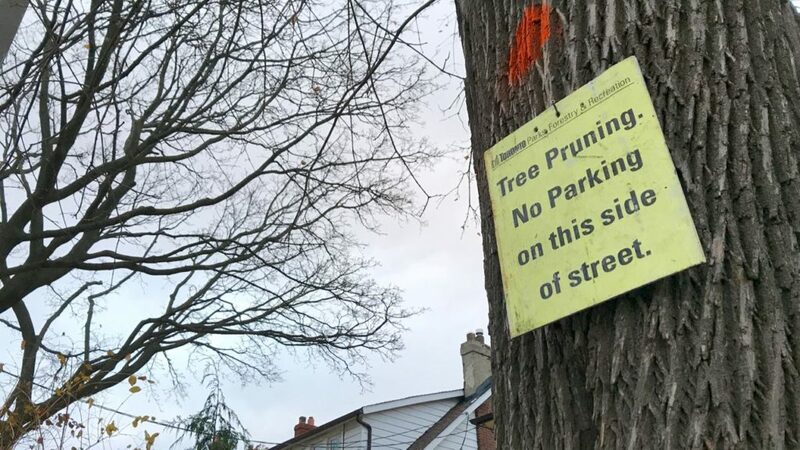 These are among the many things can shorten the life of a city tree. Street trees are also held to a higher standard than trees in the forest. 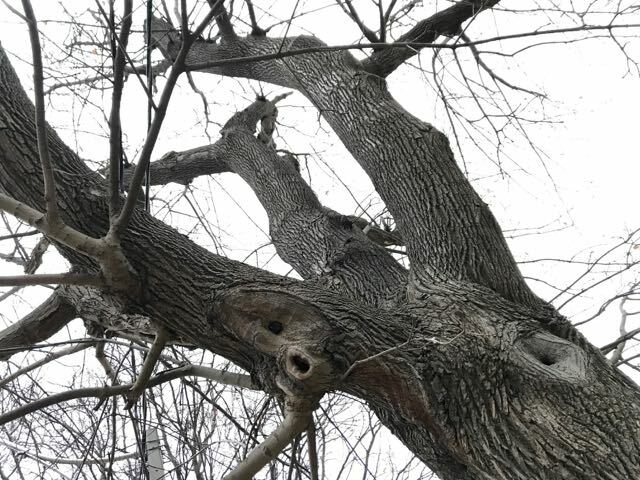 Natural aging that might be okay in a forest – and, in fact, offer yummy rotten-wood housing for bugs that feed birds like woodpeckers – is not okay when a falling branch might bonk someone’s head or car. 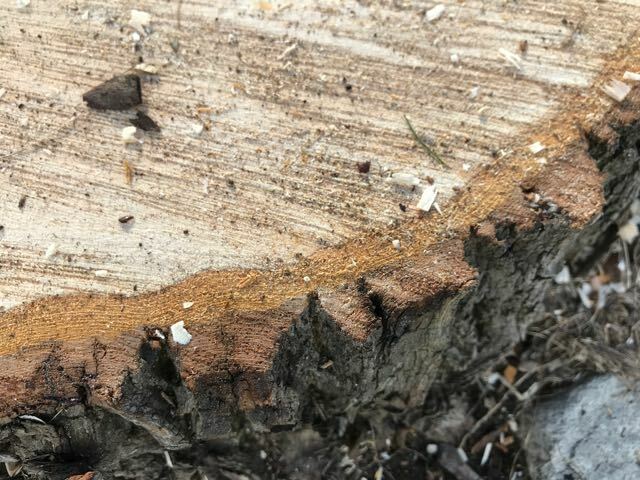 At the centre-right of this closeup of the stump, you can see the punky wood that extended right through the trunk almost to the base of the tree. Once the tree’s supportive heartwood is open to air, elements and insects like this there’s no going back. In the case of this tree, die-back in the crown was clear in the bare branches in summer. Further inspection where the trunk met the main branches showed that the trunk was slowly rotting. Unfortunately, it had to go. The dark brown is bark, the mid-brown is the phloem, vascular tissue that transports food made by the leaves to the rest of the tree. The very fine line between the corky phloem and the lighter sapwood is the cambium, the only reproductive cells in the trunk. 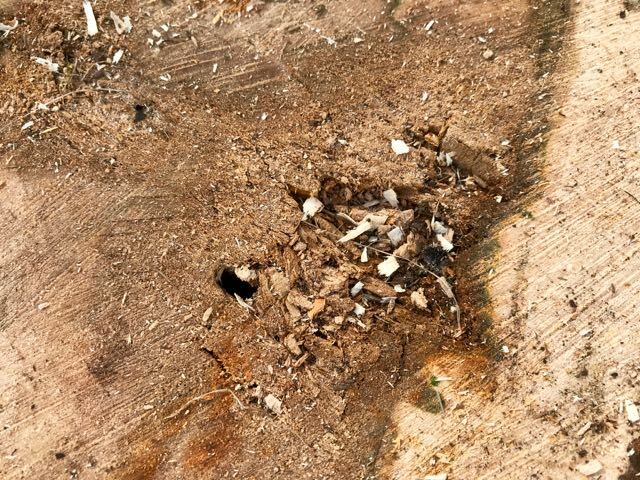 It’s the growth and slowing of those reproductive cells each year that makes the tree rings. The sapwood contains the xylem, which transport water and nutrients from the roots and soil to the leaves. But only the outer few centimetres are active. Then the xylem becomes heartwood – the core of what we think of as wood – that holds the tree upright and firm. When it begins to rot, the tree can’t heal itself. 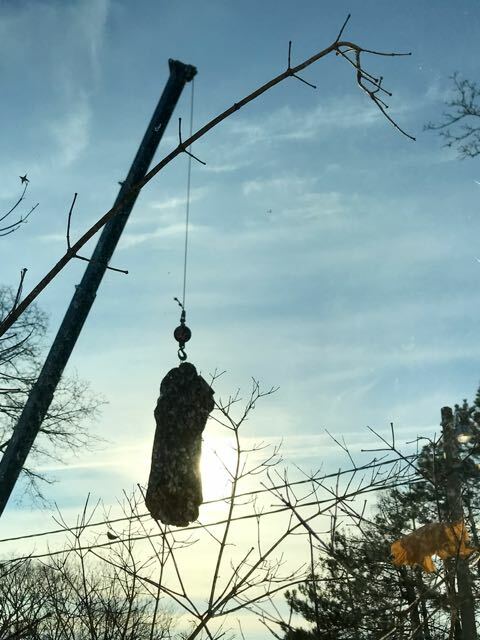 If it’s a city tree, it must come down. Our neighbour M has promised to replace his maple with another street tree. I’m rooting for a white oak (Quercus alba). What would you plant? Living with Norway maples has taught me plenty over the years, and piqued my curiosity in so many ways. Explore them through the links below. Like many of these aging street trees, it was beginning to rot from within, Traci-Anna. I’ll update the post with a couple more pictures to explain. Thank you so much for this post. I have struggled with gardening under one of these mature giants for the past six years, suspecting the root system is to blame. I just love to feel vindicated! (Thanks, BMQ, for forwarding this article). I wish I could find a work around, as our messy old gem of a Norway Maple is still pretty healthy. My heart goes out to you, AJM. If you search our blog for “dry shade” you’ll find a number of posts with tips (good and bad) on our 30-year experience of gardening under Norway maples. Great post, thank you. Especially loved your discussion of the factors in a city environment that can affect trees. If you are rooting for a White Oak, then I am ,too. Of course, you’d be replacing a non-native with a native tree, and the wildlife will be nourished! Haven’t had a chance to check with M on what he plans to plant there. 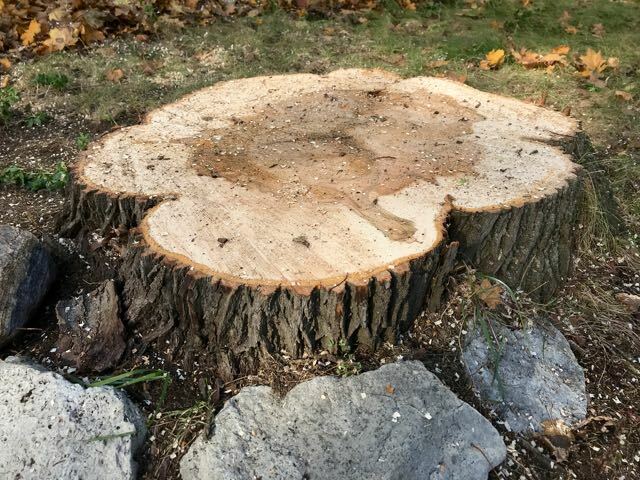 The tree folk will be coming back to grind the stump first. After that, we can expect to see a lot of wood mushrooms springing up from the dead roots. Would love to see which mushrooms spring up from the non native tree. Please send and post photos as I am starting to learn about mushrooms.